Hairy bittercress is a common plant yet not one that makes it on the top twenty list of favourites. Like other members of the mustard family (Brassicaceae), it is a winter annual or biennial plant that is native to Europe and Asia, but has naturalized worldwide. 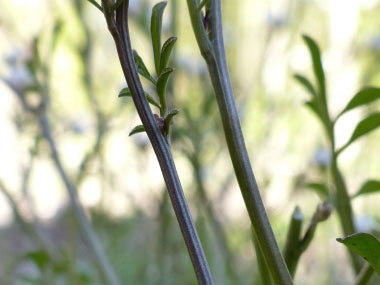 It is sometimes referred to a flickweed because the pods flick the seeds out when ripe.This plant has a twelve week lifecycle so if left undisturbed a patch can grow quite substantially in a year. Cardamine is Dioscorides' name for cress. 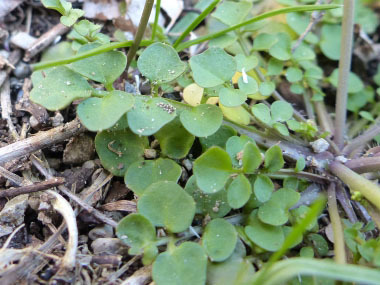 Distinguishing Features: Hairy bittercress can appear like other cresses but it can be differentiated by its dense rosette and that it often has many stems.The stems are usually erect and in the typical mustard manner, seed pods grow along the upper stem, above the leaves and below the flower. 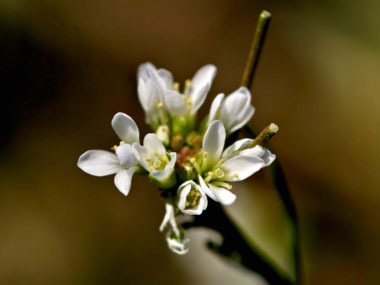 Flowers: Flowers are tiny (2.5 to 5 mm long), white, with four petals. They grow in small groups at the top of a vertical stem. The stigma is sessile or almost sessile. Sepals measure 1.5 to 3 mm long. They are usually green with a white margin. Typically there are four stamens, sometimes six. Flowers bloom late April to early June depending on geographical location. 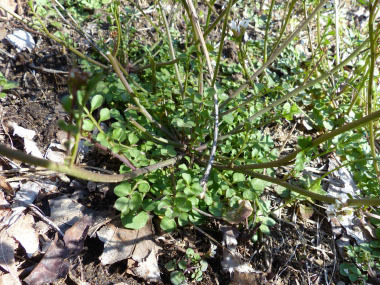 Fields of Nutrition has medicinal benefits and vitamin/mineral content of Hairy Bittercress. Leaves: Leaves are basal rosette, many-leaved, stem leaves are alternate, usually 2 to 4, rosette leaves are smaller, stalked, with the stalk somewhat hairy. The blade is pinnate, 1 to 4 paired, with terminal leaflet, leaflets are roundish, terminal leaflet larger than others. Leaves are kidney-shaped. Height: This species grows to no more than 30 centimetres (12") tall. The stem is erect and usually glabrous. 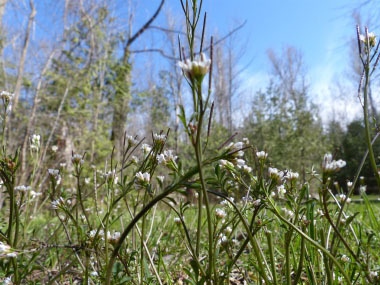 Habitat: Hairy bittercress occurs on bare soil, in woodlands, and sometimes in light grassy areas. It likes dry slopes, juniper meadows, forest margins, wasteland, crags, rocky outcrops, sometimes as a gardens weed. 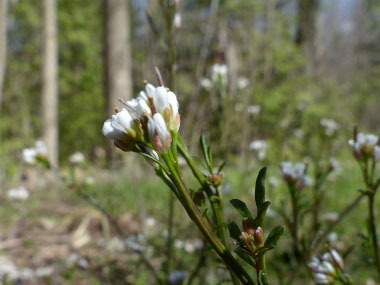 This plant grows on all continents with the exception of Antarctica. Edible parts: This plant is great for salads, salsa, pestos and anywhere you would use raw cress. It loses most of its almost argula-like flavour when cooked. Flowers and leaves are edible. Flowers can be tough to chew. Leaves are tender and have lots of vitamin C, calcium, magnesium, beta-carotene, as well as antioxidants. 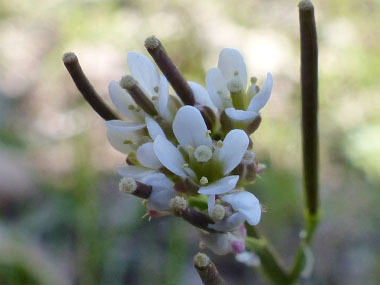 Similar plants: Hoary Cress (Lepidium draba).